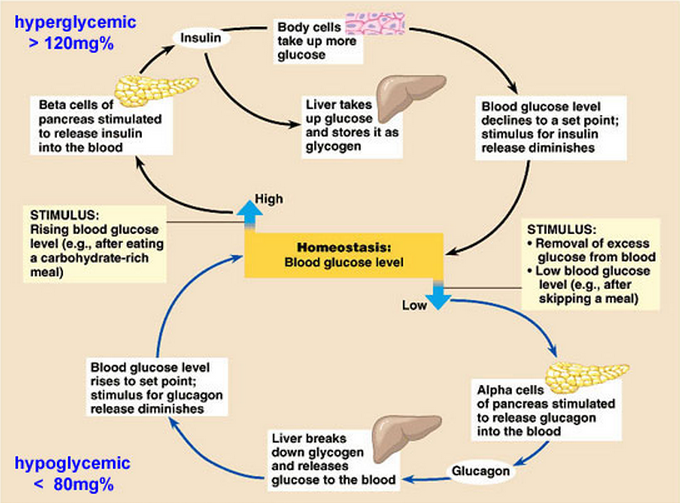 The blood glucose concentration is regulated by negative feedback control mechanisms. Blood glucose concentration should remain at a fairly constant value of about 100 mg glucose per 100 cm3 of blood. If blood glucose concentration falls well below this level, the person is said to be hypoglycaemic. Cells do not have enough glucose to carry out respiration, and so metabolic reactions may not be able to take place and the cells cannot function normally. This is especially so for cells such as brain cells, which can only use glucose and not other respiratory substrates. The person may become unconscious and various tissues can be damaged. If blood glucose concentration rises well above this level, the person is said to be hyperglycaemic. The high glucose concentration decreases the water potential of the blood and tissue fluid, so that water moves out of cells down a water potential gradient. Again, unconsciousness can result. Several hormones are involved in the control of blood glucose concentration by negative feedback. They include insulin and glucagon. Both of these are small proteins. They are secreted by patches of tissue called islets of Langerhans in the pancreas. 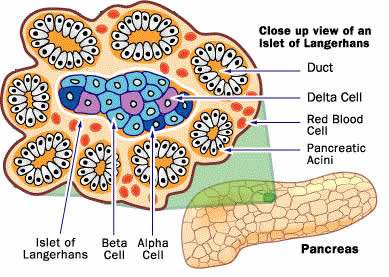 Insulin is secreted by β cells. Glucagon is secreted by α cells. causing liver cells to convert glucose to glycogen for storage. These effects cause the blood glucose concentration to fall. causing liver cells to produce glucose from other substances such as amino acids or lipids. These effects cause blood glucose concentration to rise. • Fats are broken down and respired. Maintain a good attitude. Psychological factors play an important role in stabilizing blood glucose. Controlling diet and ddhering to regular exercise could be reasonable choices. 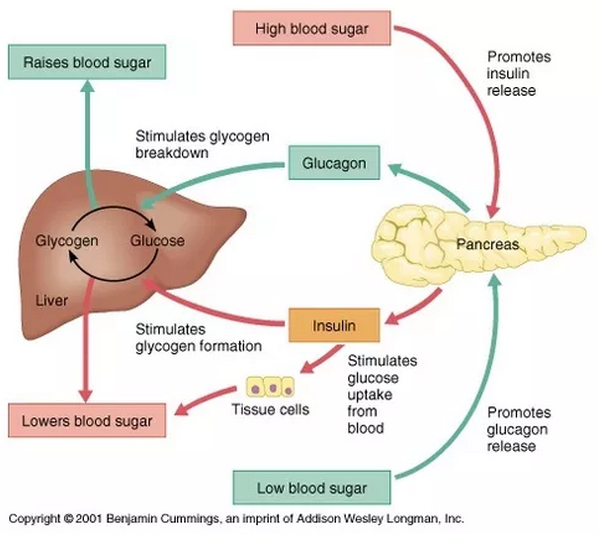 Thus to control the blood glucose is not easy as it's connected to the levels of other substances. If the connecting substance goes away from its normal track too much, drugs are needed to control the glucose. We do should to live in a healthier life style to avoid such situations.